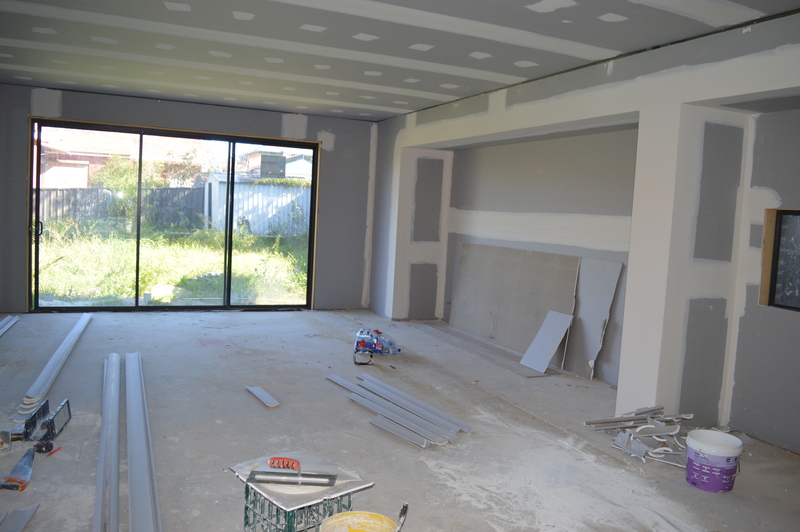 We had a team of five plasterers on Saturday working hard to finish installing the plasterboard and cornices. Oh my goodness, what a transformation! Our Hudson is looking more like a house rather than a building site. 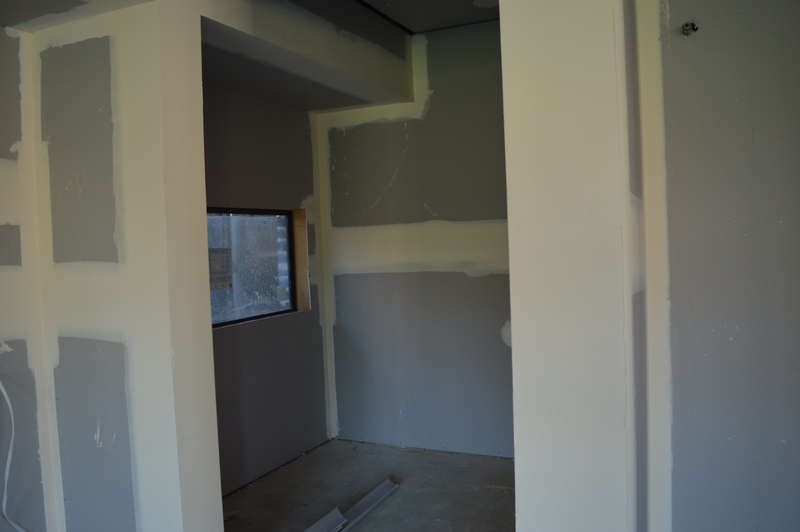 With the walls and ceiling up, we finally get a real feel for the space. 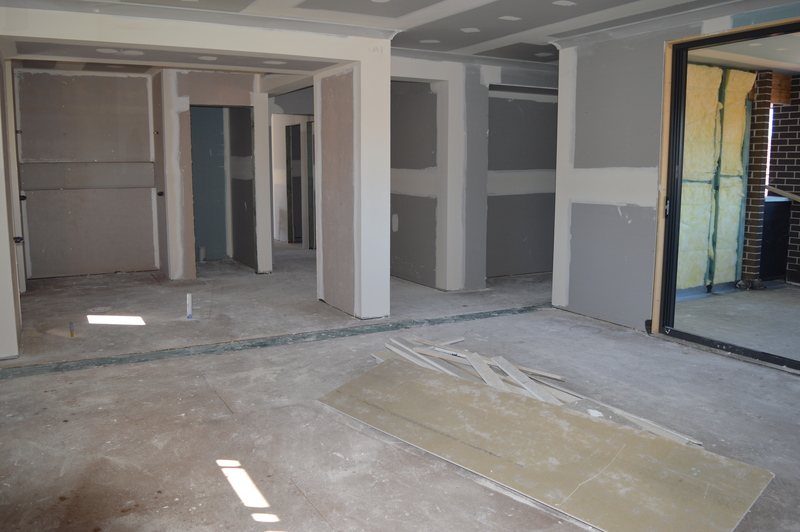 We absolutely love the open plan layout and generous size of the rooms. The render had finally been given a lick of paint. Loving the colour Dulux Mt Eden that we chose for the portico. I have to confess to being a bit underwhelmed by the facade when I first saw the painted render. I wasn’t completely convinced the exterior colours work together but thank goodness it looks much better in the sun. 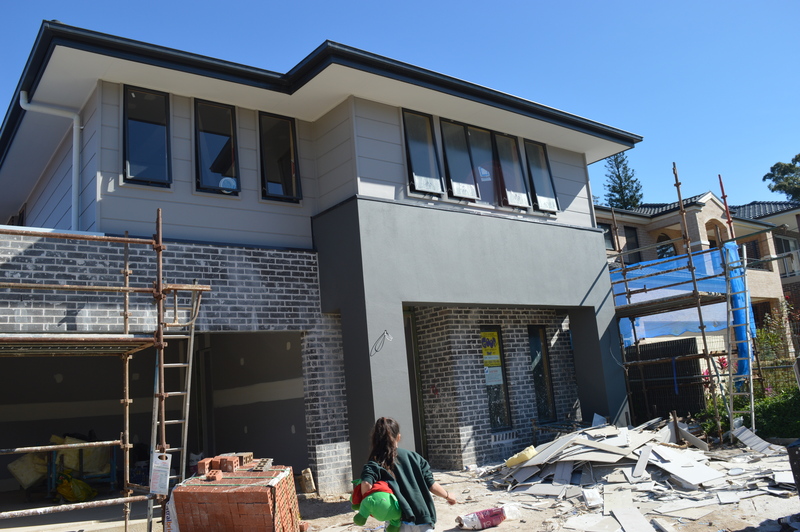 It’s slowly growing on me and I’m sure the landscape we have planned for the front garden will give the facade a lift. The remaining down pipes will be painted in Monument. Hooray for trades working on the weekend! 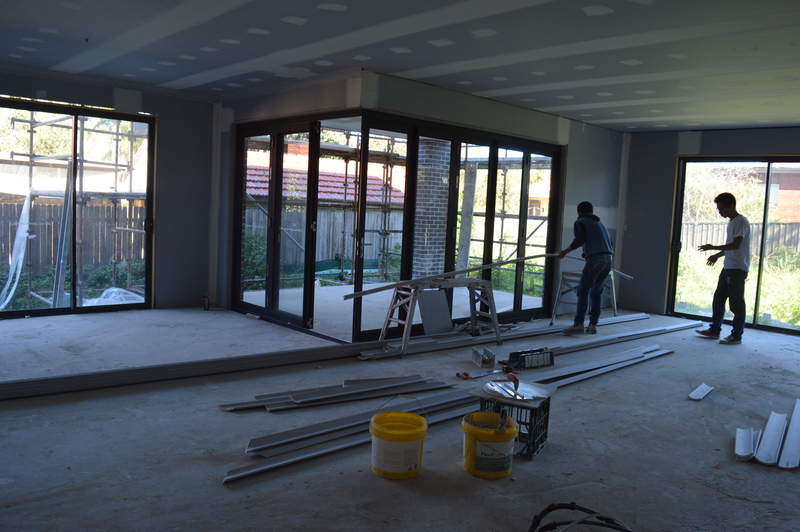 I absolutely love the cornerless bifold doors which will open up the back of the house and provide a seamless transition to the great outdoors. 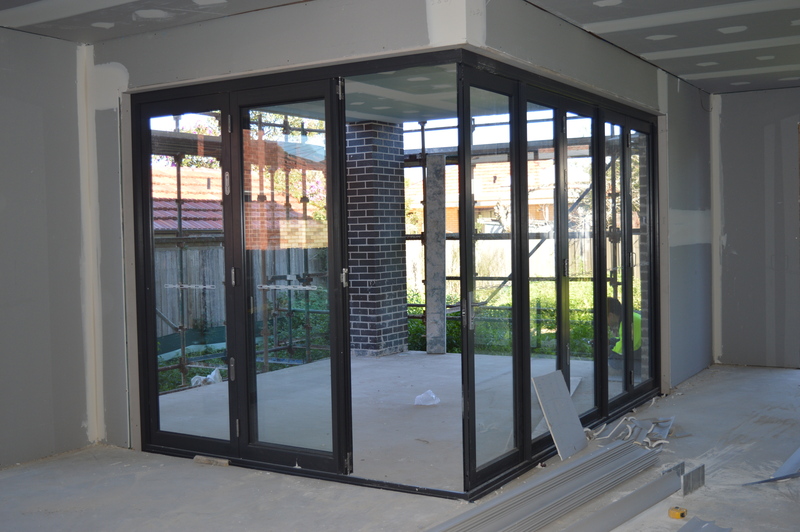 One of our must have’s – cornerless bifold doors finally installed. Yay! 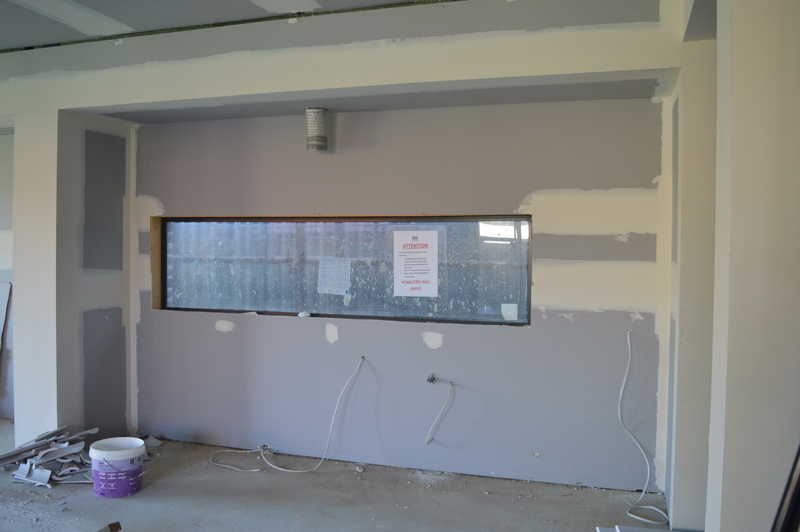 We added a microwave/oven tower to the right of the window splashback. The kitchen’s going in next week and I can’t wait to see our vision come to life. After all the dramas over the design, I’ve been dying the see the kitchen and butler’s pantry installed. 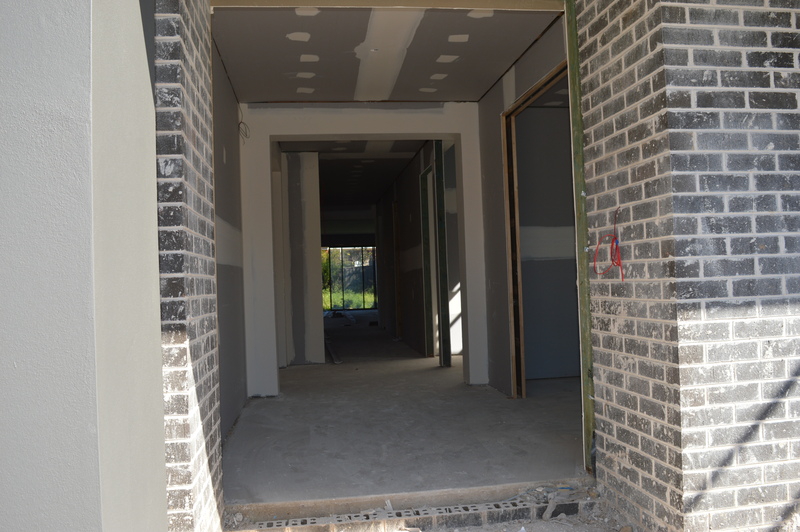 Another look at the feature stairwell window. I love the natural light flooding this space and to make full use of the gorgeous sunlight, to the left of the stairs will be the children’s study and play areas. I love love love the size and layout of the master bedroom. 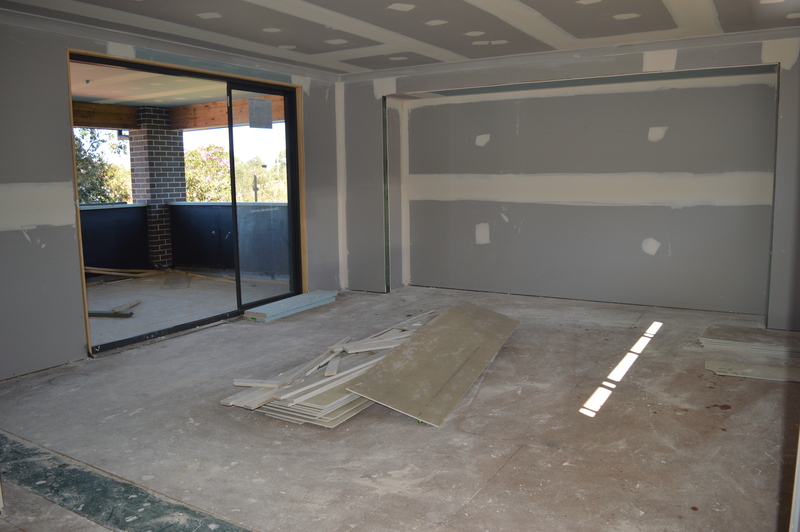 We will put in a timber panel screen in the opening of the ensuite after handover. 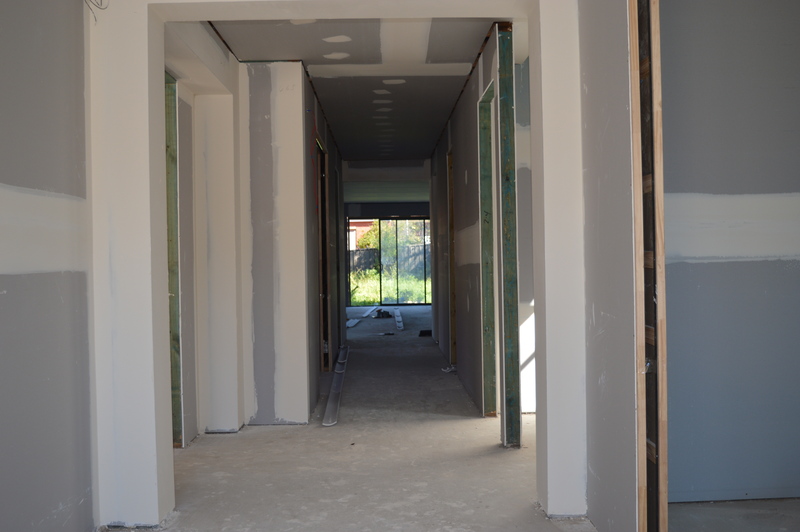 We are so happy with the progress on site. Last week was such a big week in terms of significant visual changes. We hope Metricon keep the momentum going this week and the rest of the build. The stairs are going in this week along with waterproofing and carpentry fixout. Next week is kitchen week! Woohoo! Wow. 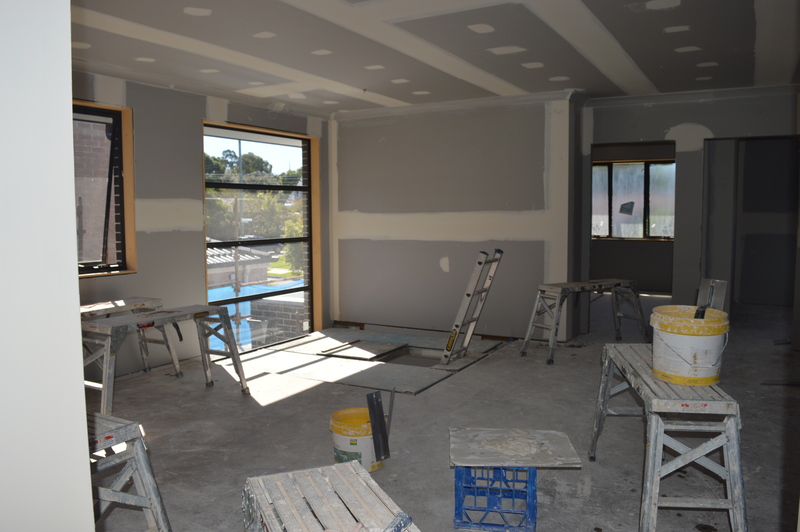 Plasterboards. Seems like a dream to me! You are powering along still. Your spaces are fantastic. Huge and open. I like the study just like it is! 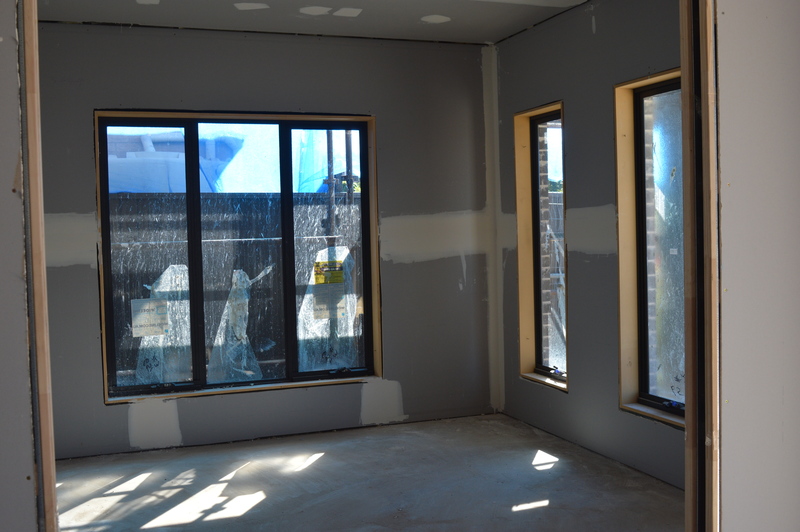 With the black taped window frames and the plasterboard looking grey in the light. Very cool. I suppose it will look completely different again in a month or so. Thanks trixee. I’m dying for kitchen week! 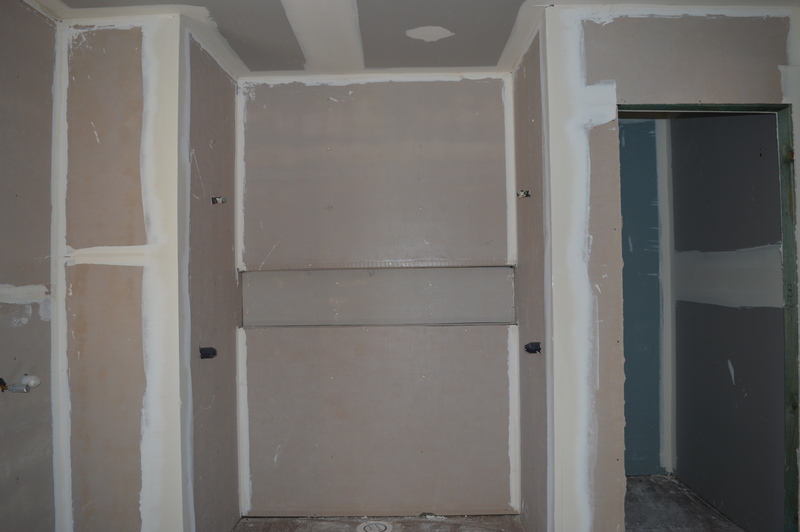 SS has gone awol so hope we’re still on track for the cabinetry to go in next week. Exciting times! Oh poo, wonder what’s been happening. I’m still using WordPress, but the self-hosted version instead. It’s still supposed to let wp users comment properly. Will have to check my settings. I can’t comment directly from WordPress Reader. I have to open your post in Safari then login to my WordPress account to comment. It’s probably user error as in me! Oh I see! Hm, I can still report this and see if they will do anything about it. I have my browser set to remember me so I don’t have to log in all the time, maybe you can try that? Thanks Cherri. It feels like a long time coming to be at this point but very happy with how everything is coming together. I’ve been wondering how your Laguna is coming along? Going well (I need to post an official update soon!). Our roof is on and we are waiting for our eaves to be finished. It seems like we are about 6 weeks behind you at the moment.